Cerebo, the National Case Study Competition of MDI Gurgaon, aims to get the best minds of the country brainstorm on possible solutions for real-time industry problems. In today’s fast-paced and dynamic business scenario, there are many immediate issues being faced by managers across different sectors. Cerebro provides a hands-on experience of solving such business problems and is a great tool for students to aid them in their quest for becoming effective managers. The event received an extremely enthusiastic participation from top B-schools across India including the likes of various IIMs, XLRI and FMS. We had about 300 registrations for the first round. After picking the best ideas from these initial entries, representatives from Cognizant shortlisted the best 6 teams for the final round. These teams had participants from IIM Kozhikode, MDI Gurgaon and IMT Ghaziabad. The judges were very impressed with the quality of the presentations by the students and the in-depth analysis validating hard-core data. The participants were judged on the basis of level of analysis, innovative thinking, originality and the quality of presentation as well as time management. 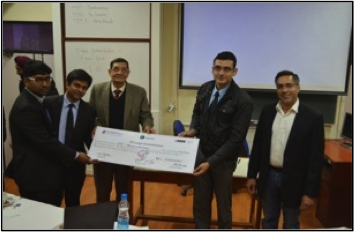 Team ‘Benchwarmers’ from IMT Ghaziabad bagged the first prize. Team ‘The Invincibles’ from MDI Gurgaon and Team ‘The Konsultants’ from IIM Kozhikode came second and third respectively.